Gili Trawangan is known for it’s white sand beaches and azure waters, but there exploring the interior of the island has some gems as well. 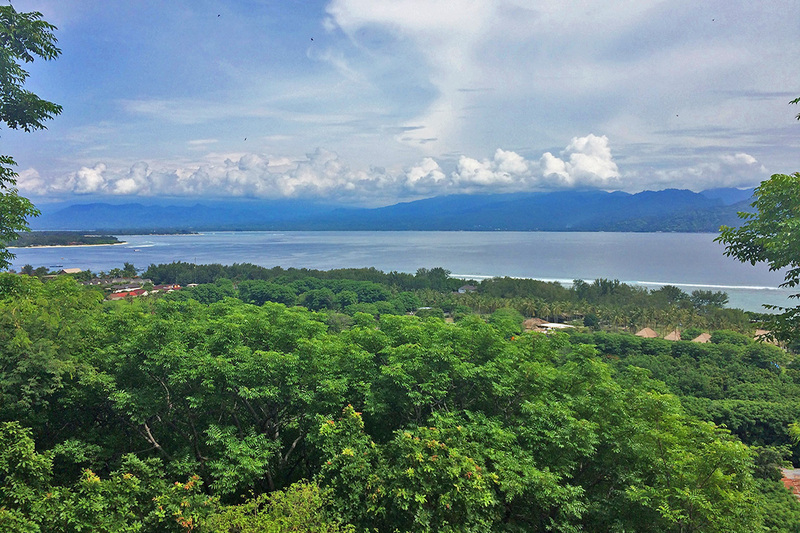 Gili Trawangan Hill is a natural viewpoint on the south-western side of the island. This forested hill is about a 25 minute walk from Villa Almarik and then 15 to 20 minutes up a relatively easy trail. This walk is often overlooked in Gili guides, but we’ll tell you why you shouldn’t miss it on a visit to Gili Trawangan. You can walk or ride a bicycle to the bottom of the hill and start the climb on the few flights of stairs that lead into a small nutmeg forest. This part of the island is very quiet and many locals believe that malevolent spirits hide out here. In this area there are also a few hotel projects that never came to fruition…locals say they were doomed from the start because of the bad spirits. One nice place to stop is a sheltered wooden platform that was probably built as a ocean-view restaurant. The views from here are lovely and it’s a very quiet spot. Starting up the hill you’ll find a small Hindu shrine here where local Hindus leave offerings to both good and bad spirits to create balance. There is also a strange shelter with four rocks written with Arabic numerals. This is said to be a burial of some type, but even the locals don’t seem to know for whom. Climbing further up the hill the shrubbery and trees start to clear and you’ll start seeing the views you’re looking for. If you’re climbing in the morning early enough you might see the sunrise over the peaks of Rinjani, Lombok’s mighty volcano. It is hot in the daytime so many people choose to climb in the evening when the sunset is really breathtaking. Did you know that Gili Trawangan was a WWII naval base, prisoner of war camp and lookout post? There are a few reminders of this time on the island, not least being the name ‘Trawangan’, which means tunnel in the local language. 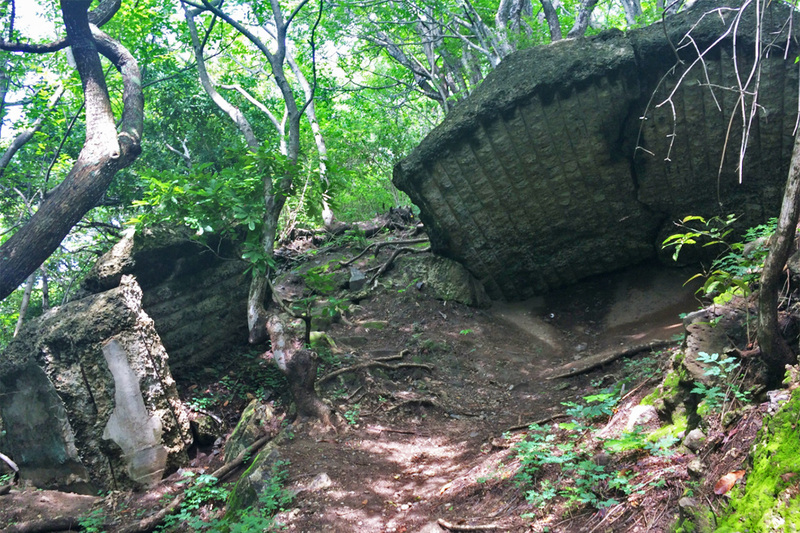 About midway up the hill you’ll find a Japanese machinegun bunker that looks a bit like a giant clamshell buried in the jungle and makes for some pretty cool photos. After the bunker the trail becomes grassy and flattens out. Looking out to Lombok the shimmering water and fishing boats dotted all around the island are in view. You can see why the Japanese chose this spot as their lookout post. Crossing the grassy field to the other side, you’ll come to the best sunset spot on Gili Trawangan. Panoramic views of Gili Meno, Gili Air, Lombok and Bali open out in front of you. If you’ve made the effort to walk to the top here you will be rewarded with time to take in the colours and sights of this paradise island. Not many holidaymakers stray away from the beaches, so you might even have the whole hill to yourself. 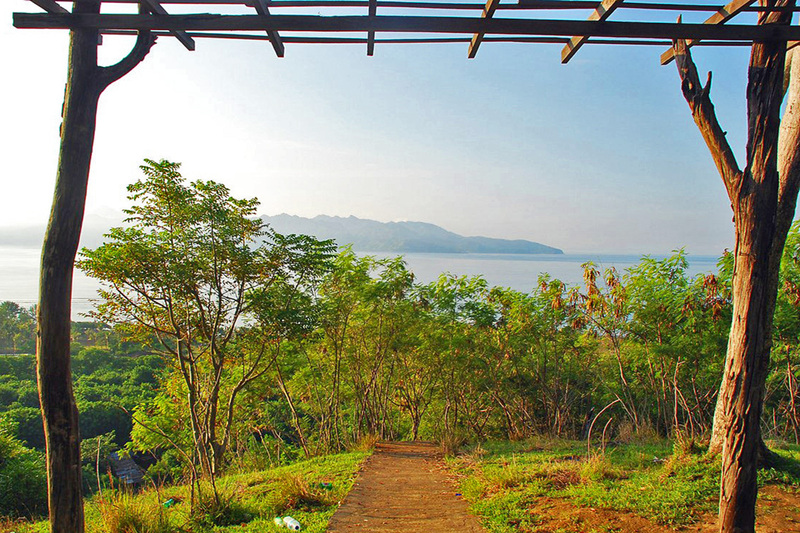 Would you take the time to walk up Gili Trawangan Hill? Let us know in the comments below.